There are many factors that affect our health. How much exercise we get, how well we eat, and family history clearly have a lot to do with it. People often overlook the extent to which home environment has on one’s physical well-being because it’s easy to overlook things that we see and take for granted every day. As a landlord, it is your responsibility ensure that your renters are happy with the place they call home. A recent study found a direct correlation between health and one’s home environment. Healthful surroundings are especially important in apartments and condominiums, smaller spaces where there may be fewer options for creating a truly safe and comfortable haven. 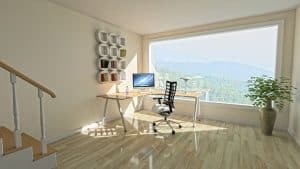 Fortunately, there are a number of relatively easy modifications you can make to create the healthful and soothing space your renters need and deserve. Carpeting is a source of many allergens and toxic substances that can threaten the health of your renters. Think about replacing it with hardwood flooring or tile, thus removing the presence of allergens, pet dander and other substances that have built up over the years and pose a threat to long-term health. Industrial carpeting often contains VOCs, toxins that can threaten your breathing air. Wood and tile are far easier to clean, requiring little more than a mop, and will be a big attraction for renters with pets, small children, and busy schedules. Unless your rental space is brand new, chances are it will look lived in. However, there is a difference between homey and run-down. Add curb appeal and make it a place renters look forward to going home to by spending some time on landscaping. It doesn’t have to be anything drastic, but a little bit of time spent pulling weeds, mowing grass, and adding pops of color via flowers are a great start. Go ahead and replace any torn window screens and give the exterior and pathways a good powerwash. If you have a balcony or outdoor patio area, breathe fresh life into them with potted plants — just don’t forget to water them. Many paints contain toxins, which have been identified as the cause of neurological problems in children. There are many natural, non-lethal paints on the market these days, made from milk, berries, and various plant-based dyes, that make excellent alternatives and preserve a healthful living environment. Remember that any lead-based paint, which the EPA years ago identified as a health risk, should always be replaced. Most homeowners spend between $211 and $6,298 nationally to address home safety concerns related to lead and asbestos removal and improved air quality. Be sure to use quality tools, like a durable hammer or drill, if you’re planning to make home modifications yourself, or replace an old paint job that’s showing its wear. When repainting, stick to neutral colors such as white and tan, but if you allow it, encourage renters to paint walls with a color palette that suits their style. Pleasant smells can contribute to a positive mental state and sense of well-being. Add some scented candles, an infusing device, an oil burner, or vaporizer to create a nurturing and soothing environment for your renters. If there is a bedroom or bathroom that tends to retain unpleasant smells, consider taking an aromatherapy approach. Or try setting out a couple bowls of coffee beans, which are effective at absorbing bad smells and infusing indoor air with a pleasant, natural smell. Try reassessing your rental space as a source of relaxation and stress reduction. Focus on activities, smells and sounds that are soothing and make modifications accordingly. Remember, if you need to remove or replace anything toxic, such as lead paint or carpeting, consider hiring a professional. With a few simple changes, you can turn a rental space into a home.